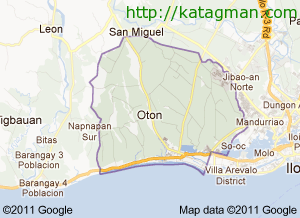 Right next to VIlla de Arevalo is the progressive coastal town of Oton. Founded in 1572, it is the third oldest pueblo in the country after Manila and Cebu. During the Spanish colonial period, it was made the capital of the Province of Iloilo (Alcaldia de Oton), which covered the islands of Panay, Guimaras, Tablas, Sibuyan, Romblon and the western part of Negros. By air, Iloilo is 45 minutes from Manila and 30 minutes from Cebu. It is a 1-hour ride from Cabatuan Airport and 20 to 30 minutes from downtown, Iloilo City. A good number of taxis, beautiful public jeepneys of Oton and interior towns will take visitors to the first pueblo in Panay. Sailboat and motorboat enthusiasts may reach it by sea.